9 YRS Hangzhou Linan Trustool Machinery Co., Ltd.
About HKAA 1. 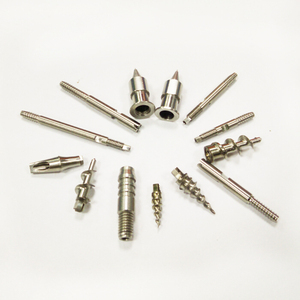 Advanced facilities ensure the Top quality , over 200 sets high precision CNC machines 2. Same/Better quality with Germany ,USA 3. Over 30 sets 5 axis CNC from Germany and Japan 4. Certificate: ISO9001:13485,TS16949,AS1900 5. 100% guarantee quality , lead time . we have the integrated system for industrial parts quality control. IQC IPQCS FQC OQC departments to control each process of industrial parts prodution. china supplier cnc machining services brass turned parts for pipe plug Capabilities: 1.Vcnc milling the workable length 1-12000mm the workable diameter 1-6000mm the tolerance ISO 2768-F the operation system of the machines FANUC R & D engineering team design the technical drawings STP,IGS,PRT,AUTOCAD,PDF. 3.The fa b rication Our plastic injection machines could do the mold injection parts and the assembles from 0.005kgs to 1.5kgs ,we are also experienced in the stamping ,the bending ,and the welding ,our equipments are advanced in these fields,so we are always doing the exellent fabrication job. In the fabrication,we often use the melting welding,the pressure welidng,and the laser welding, the experienced technicians do the melting welding perfectly , the welding seam is straight , there are no gaps , no holes , no welding slags . Alibaba.com offers 4,281 plug metal part products. About 13% of these are machining, 5% are sheet metal fabrication, and 1% are other metal & metallurgy machinery. A wide variety of plug metal part options are available to you, such as metal, iron, and plastic. You can also choose from free samples, paid samples. There are 4,281 plug metal part suppliers, mainly located in Asia. The top supplying country is China (Mainland), which supply 100% of plug metal part respectively. Plug metal part products are most popular in North America, Domestic Market, and Western Europe. You can ensure product safety by selecting from certified suppliers, including 1,481 with ISO9001, 425 with ISO/TS16949, and 396 with Other certification.